We hope that you are all enjoying the festive season! 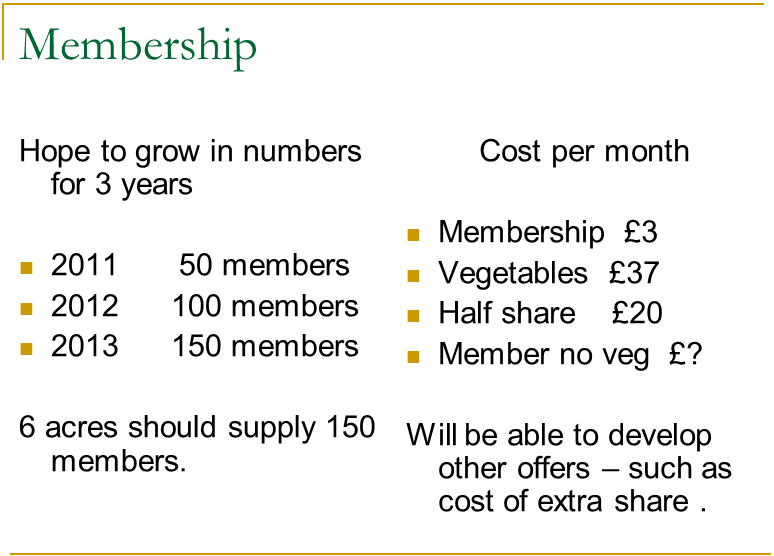 For those of you who weren’t able to come to or weren’t aware of our recent public meetings, you can download our membership offer here and our joining forms here. We are still a long way from meeting our goal of 50 full-share members so we can get growing in January, so please spread the word! As promised at the meetings here is a recap of the presentations and slides. The meetings were broadly broken down into the topics highlighted in the sunflower pictured at the left. Tim presented the principles and thinking that lie behind our vision for Sims Hill. Please go here to see a recap of these from our first meeting. James presented the updates to our site plan since June. Please go here to see James’ previous draft plan for the site. 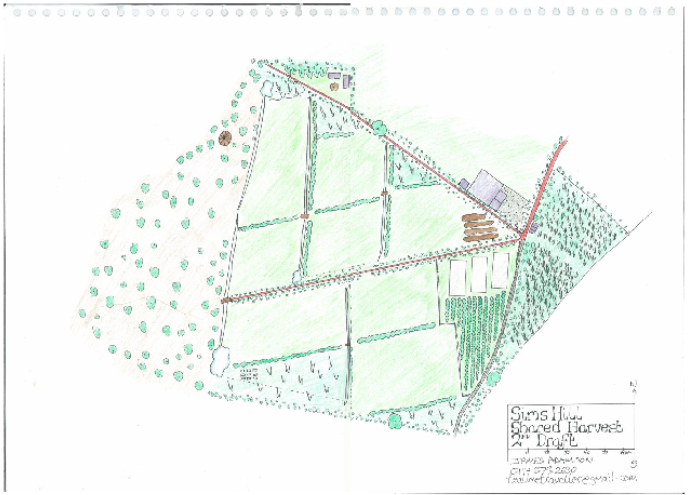 James has developed a working permaculture design for the site. A key update to the site plans is around how we will be handling the water supply for the site. 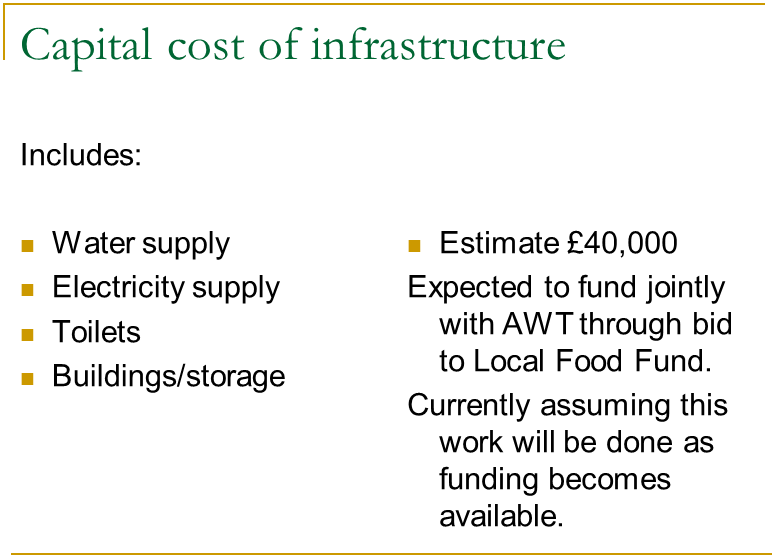 Using a borehole to supply water to the site will be expensive and not that practical for this site. Our current solution in lieu of hooking up to the mains suppy will be to use a system of ponds on the ridge to collect rainwater. This water will then go through a system of underground pipes to a system of swales. This will help to droughtproof the land for the field veg. 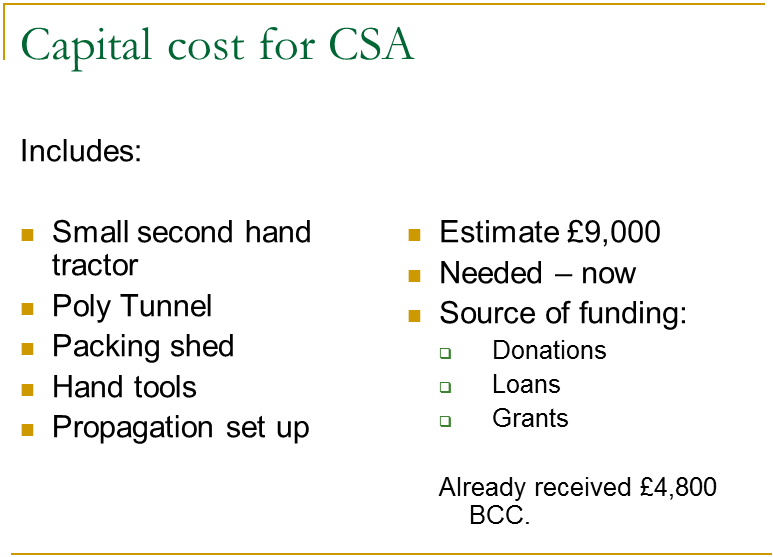 We will need to connect up to the mains supply to water polytunnels and garden/salad veg. We are beginning with field veg as that needs fewer resources. As we expand we will add polytunnels -– veg can then be harvested 52 weeks a year.. We will be emphasising local and seasonal veg in our boxes. Our goal is eventually to have enough veg for 150 full share members, but we are starting out with 50. In addition to the core veg there are opportunities for members to get involved in expanding into fruit production, coppicing, bee-keeping, and possibly even products from the coppicing etc. We want to welcome the wider community into the project by emphasizing diversity and Community Development principles, so we can all learn to work, learn, and play together. Along with our professional growers, we want to offer opportunities for people to come in as apprentice growers, and to substitute work hours on the plot for paid shares. As we move into profit we are also hoping to offer some bursary place for lower-income people. We also want to build the Sims Hill community through on-site activities such as our regular work days, social events, and seasonal celebrations. We want to offer a different vision to the regular consumer model where people are now very disconnected from where their food comes from. 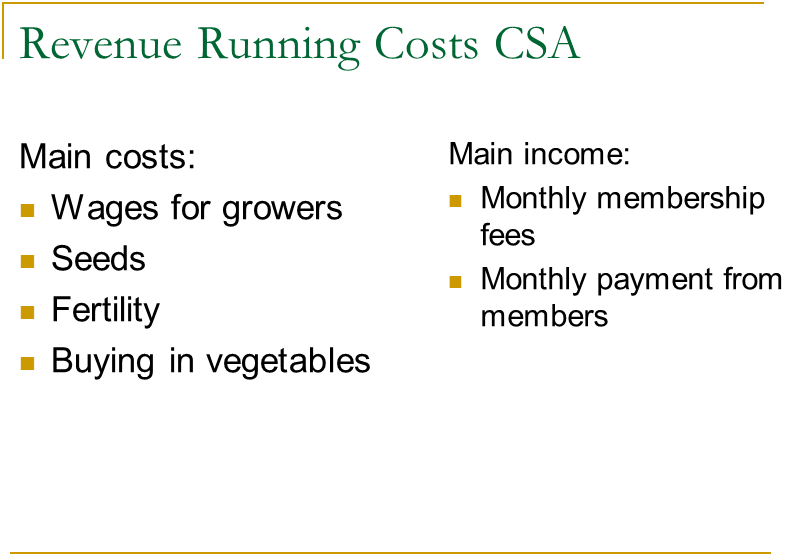 A CSA project is not a consumer/veg box model. 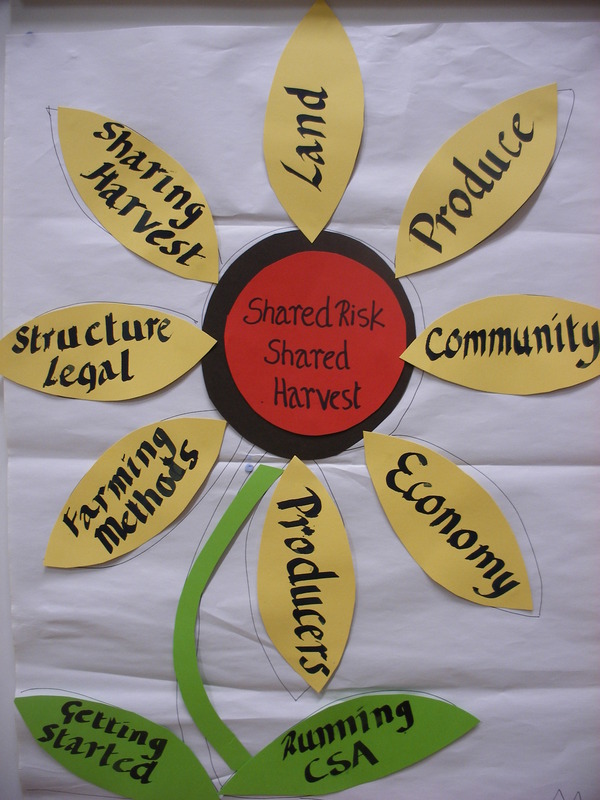 Members invest both money and time in running the farm and helping to keep the ecosystem and the community healthy. Basically we are all investing in the doing, not just in getting a veg box. This is a shift in emphasis and a step out of the consumer culture. 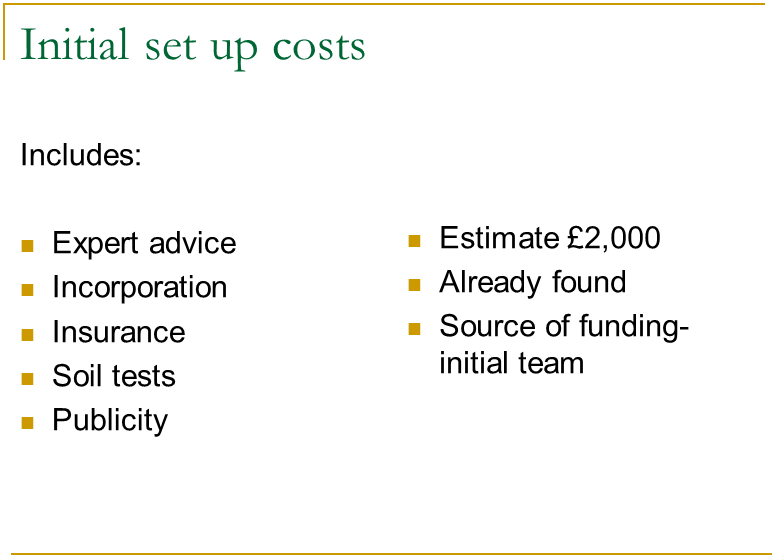 We want to use minimal capital investment and we are not using a profit–driven model. We want to look much more to our own internal and natural resources. We want Sims Hill to be a cooperative-drive viable business. We hope that ALL members will spend time on the site with our work days, celebrations, and future associated projects. Our producers will be Tim and James to start with, and that may expand eventually to a grower’s cooperative. Additional work and educational opportunities will be provided through our apprentice programme and workshare scheme. We hope that ALL members will spend time on the site with our work days, celebrations, and future associated projects. Hand tools for weeding, etc. We have incorporated as a company limited by guarantee using multi-stakeholder cooperative rules. 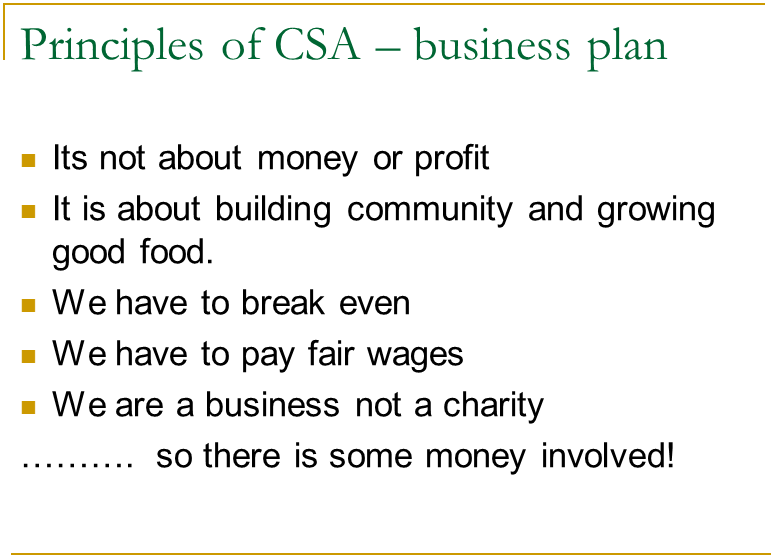 We cannot distribute profits to members under this model. However, this is a flexible model that will allow us to incorporate as an Industrial Provident Society at some point in the future. We will work in practice as a cooperative. Members will help set up overall strategy and will elect the Board of Directors. The Board will supervise the legal and financial aspects of the business and also provide employee oversight. There will be 5 member meetings a year and three types of members. Harvest share members, growers, and supporter members. Please go here to see here our articles of incorporation. We will produce a veg box 52 weeks a year. Members can come and collect their boxes at the plot or they can come to as yet unspecified drop-off points around the city. Members will be allowed to put unwanted veg in a gift box and also take from it. There are full shares and half share options. The amount will vary with the seasons and can be shared among people in different ways.